The Certified Professional in Training Management (CPTM™) program is backed by a body of knowledge collected from learning leaders across the globe over the course of a decade. 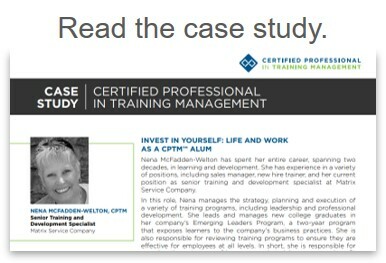 The results of this research study are published in the book, “What Makes a Great Training Organization?” and reflected in the Training Manager Competency Model™. With a focus on the core responsibilities and key competencies of the training manager and the best practices of great training organizations, the CPTM training program provides an understanding of how to apply those principles when aligning your learning and development plan to the goals of your organization. This serves as a foundation from which the training manager creates strategic alignment, identifies needs, develops and delivers solutions and evaluates performance. 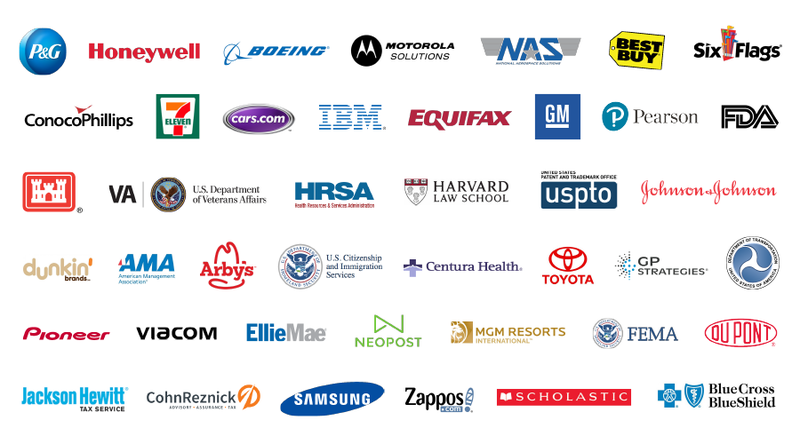 CPTM alumni work in leading companies in a variety of industries globally. Hear what graduates of the CPTM training program have to say about their experience. Read reviews from CPTMs here. 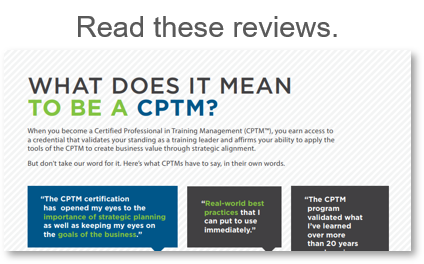 More than 95% of CPTMs have been able to apply principles from the program on the job.